Konami not only makes video games, it also owns a string of sports clubs in Japan. One of its employees, Kohei Uchimura, is on the Japanese Olympic team—one of four Konami employees, that is. According to Japanese daily Nikkan Gendai, Konami will allegedly pay the gymnast a "gold medal bonus" if he takes gold at the London Olympics. The bonus was reported to be nearly ¥10 million ($US125,000). Uchimura would be the first Konami employee to win an Olympic medal. Bonuses are common in the Japanese corporate world, but medal bonuses are also common in the Olympics. So what's the big deal? Whatever it is, Konami stated in a recent release that the Nikkan Gendai story isn't true. 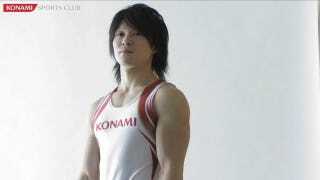 If Uchimura does win gold, look for Konami to reward him with more than a bonus. Gymnastics video games, anyone?